Nash was a mystery. He was a fan of the dark, strange, and macabre. He managed to turn those inspirations into a bizarre and unique persona, with music and stage show to match. An outsider artist, Nash never really fit into the simple confines of a particular genre or even mode of his work. He was a rocker who didn’t play rock. He was a classical violinist who electrified and terrorized his instruments. He was a visual artist. A performance artist. No single category could define what he did. He blazed trails for today’s avant garde performers. He breathed fire (before Gene Simmons), he performed with drum machines (before they were deemed acceptable), and he recorded his music with some seriously beaten up effects and tape machines. He was enigmatic, and yet he was also so damn normal. 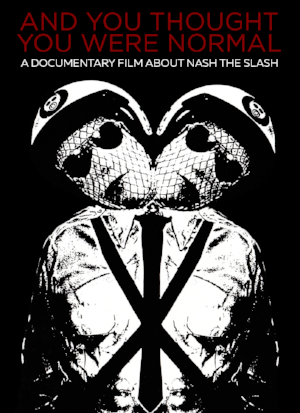 This film will peel back some of those bandages so you can see the real Nash. HOW DID THE BANDAGES BEGIN? Even with this, the truth is hidden somewhere in the nuances of multiple tales, and the decades since their inception have only proved to make the truth more vague. Depending on who you ask, Nash started wearing the bandages at the behest of his lighting designer, as a way to project more visuals onto himself and his backdrop. Nash also reportedly started the look as a reaction to the Three Mile Island nuclear incident, wanting to appear as a glowing survivor of all the ills of the modern age. Either of these could be true. Neither may be true. Like all things Nash, the truth is what you want to believe, what you may want to project onto the artist and his work. Nash left us as he lived with us, a mystery. A suspicious neighbor. A call to the police. An announcement that the man left us quietly, peacefully. Nash passed away on May 10, 2014, aged 66.